Of all the installations that make a modern home go, the electrical system is perhaps the most important. Without electricity, we wouldn’t be able to enjoy the convenience that is indoor lighting, nor would we be able to enjoy the many devices that makes our lives that much more enjoyable. Should your electrical wiring experience any issues, your home’s electricity as a whole could experience issues with its performance. And that’s not to mention the risk that faulty wiring could pose to you and your safety! If your electrical wiring is experiencing any issues, don’t fret. Instead, just call on your local San Antonio electricians at John Jones Electric for an electrical rewiring! Your electrical system should be safe and reliable, and with an electrical rewiring by John Jones Electric, you can be sure that that’s exactly what it will be! When your electrical wiring experiences issues, your safety can become compromised. After all, wiring issues pose a chance of causing an electrical shock -- or, worse, a full-on electrocution! Your home should be just about the safest place around for you, but with compromised electrical wiring, your safety could always be at risk. We at John Jones Electric will get your electrical wiring fixed and, thus, keep your home as safe as can be for you and your loved ones thanks to our quality rewiring service! Of course, potential safety risks are only one of the problems you could experience because of wiring issues -- and, oftentimes, not even the most common problem. No, rather, a much more common problem you’ll experience with wiring issues is that your electrical system will simply work inefficiently. And working inefficiently, over time, your electrical system will begin to cost you more and more money in increased electric bills as the setup has to work twice as hard for the same results. If your electrical system is working inefficiently and costing you more money than you’d care to pay, then don’t hesitate to call up your local electricians at John Jones Electric today! 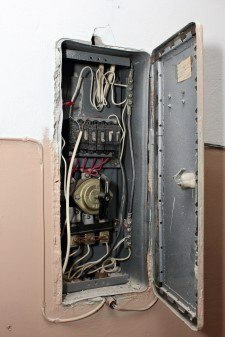 We at John Jones Electric will get your electrical system working efficiently once more with our quality rewiring work!